On An Overgrown Path: Why Western music? I firmly believe that music will someday become a 'universal language'. But it will not become so as long as our musical vision is limited to the output of four European countries between 1700 and 1900. The first step in the right direction is to view the music of all peoples and periods without prejudice of any kind, and strive to put the world's known and available best music into circulation. Only then shall we be justified in calling music a 'universal language. That perceptive observation was made by Percy Grainger in 1933. I was reminded of it while listening last weekend to BBC Radio 3's marathon broadcast Why Music?, which explored how music can manipulate our behaviour, shape our brain, and affect our physical and mental well-being. The relationship between music and behaviour is a very important topic, and it is one that On An Overgrown Path has explored. Why Music? was presented jointly with the Wellcome Trust; this is a a London based biomedical research charity with a £18 billion endowment derived from the fortune of the American-British Sir Henry Wellcome (1853-1936), founder of the Wellcome pharmaceutical empire, now part of GlaxoSmithKline plc. The BBC and the Wellcome Trust are to be commended for presenting an extended exploration of the relationship between music and human behaviour, and it is praiseworthy that the project created three new music commissions. But what struck me about Why Music? was how its execution contradicted Percy Grainger's vision of 'universal music'. It can be argued convincingly that music from the Eastern traditions pioneered the manipulation of behaviour with trance, and the enhancement of physical and mental wellbeing with nada yoga. Yet with just a few exceptions, the three days of broadcasting focussed solely on Western music. The opening concert was of music by Elgar, Bridge, Barber, Richard Rodgers, Bernard Herrmann, Peter Maxwell Davies, Judith Weir and Jonathan Dove, while Nobel Laureate Frank Wilczek, Professor of Physics at the Massachusetts Institute of Technology presented his personal choice of music which included Bach, Beethoven, Mendelssohn, Mozart, Queen, and Gilbert and Sullivan. The over-hyped centrepiece of the marathon was the German-British composer Max Richter's six hour long Sleep, an advertorial opportunity that Universal Music/Deutsche Grammophon/Sinfini crowd will doubtless milk for months. An all-night concert is a commendable innovation - been there and done that - but would not a night raga and a Gnawa trance ritual plus a little - just a little - Max Richter have been more inclusive? And could not the Western scientific dogma of the usual talking heads have been leavened with a little Eastern metaphysics? Mixing Western and Eastern music in conventional concerts may be a step too far for the BBC at this stage. But the off-the-wall format of Why Music? presented an ideal opportunity to present music as a universal language, and that opportunity was missed. But others with much smaller resources are grasping the opportunity: out on the edge of the network a small charity called REEP is working to foster environmental concern and understanding – spiritual as well as practical – in young people. Their work inclused the Shore to Shore Project, an exploration of life, faith and the environment through a series of activities in England and Morocco. 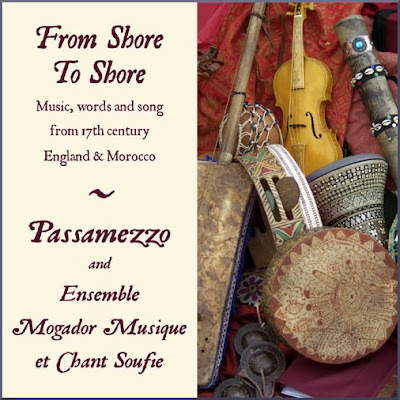 The output from the project includes two CDs recorded by early music group Passamezzo and the Sufi Ensemble Mogador from Essaouira in Morocco - a town I know well. 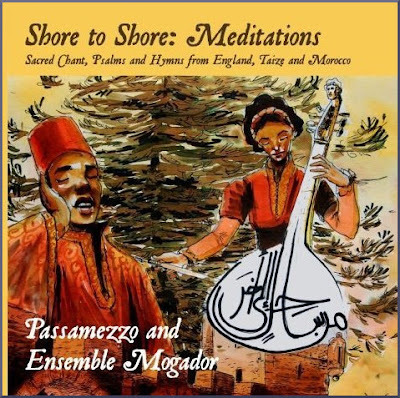 The truly universal music on these CDs is a blend of Moroccan Sufi chant (Arab-Andalusian and Gnawa), chants from Taizé - another sacred place I am familiar with - 16th century English psalm settings, and divisions for the viol and lute. REEP, Passamezzo, and Ensemble Mogador do not have a multi-billion pound endowment or cosy relationships with the BBC and Universal Music. So their latest CD 'Shore to Shore; Meditations' was recorded in just seven hours in St John's Wood Church, London in June. Which is not a problem as John Coltrane - another believer in the universality of music and faith - recorded 'A Love Supreme' in one day. 'Shore to Shore; Meditations' may not be on quite the same level as Trane's masterpiece; but it is an impressive endorsement of Percy Grainger's dictum that we need to view the music of all peoples and periods without prejudice of any kind. 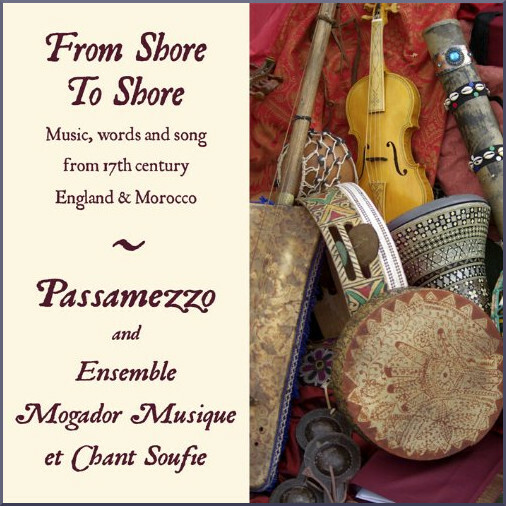 They may be modest in ambition, but these CDs from Passamezzo, and Ensemble Mogador are one step towards tackling the institutionalised prejudices of the music establishment. One featured CD was purchased, the other was a review sample. Opinions expressed here are mine only, and I have no connection with REEP, Passamezzo, and Ensemble Mogador other than as a recipient of a review CD. Any copyrighted material is included as "fair use" for critical analysis only, and will be removed at the request of copyright owner(s). Also on Facebook and Twitter. Even just incorporating Jordi Savall into the exploration would have been an enhancement, but for me bouncing all the usual programming was just a pity.